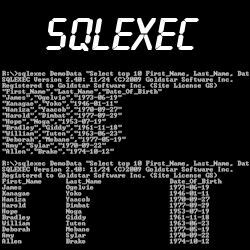 SQLExec provides access to the SQL/ODBC environment from the command line, providing for clean and simple database exporting, as well as command-line driven SQL statements. It can be used to schedule stored procedures, to automate database creation, or for importing data as well! This license allows you to use SQLExec on any computer on your local area network.